Dues to a shifting diplomatic schedule, this event is being rescheduled. Please join the Columbia University Club Foundation Trustees and members of the United Nations Association of New York, the Penn Club of New York, and the Columbia University Club of New York for a presentation by Carlos Alfredo Vecchio, a Venezuela politician and diplomat, has been appointed on Jan 27, 2019 by Venezuela’s opposition leader and interim president Juan Guaidó with the official diplomatic title of chargé d’affaires, a position accepted by U.S. Secretary of State Mike Pompeo. Admission Registration is open to all Columbia Club and United Nations Association New York members. Member admission is free. Guests admission is $15. Registration is required. Carlos Alfredo Vecchio father, Rafael Vecchio, was councilor of the Caripe municipality for three consecutive periods. His mother, Maria Teresa Demarie de Vecchio, was a school teacher, daughter of Luis Demarie, a native of Luri, Corsica, France. In 1987, Carlos Vecchio moved to Caracas where he studied at the Central University of Venezuela and graduated as a lawyer. Later he did a postgraduate degree in Tax Law at Georgetown University and a master’s degree in Public Administration at Harvard University. Vecchio was a candidate for Chacao’s mayoralty in 2008 and a candidate for deputy for the National Assembly in the primary of the Democratic Unity Table of 2010. 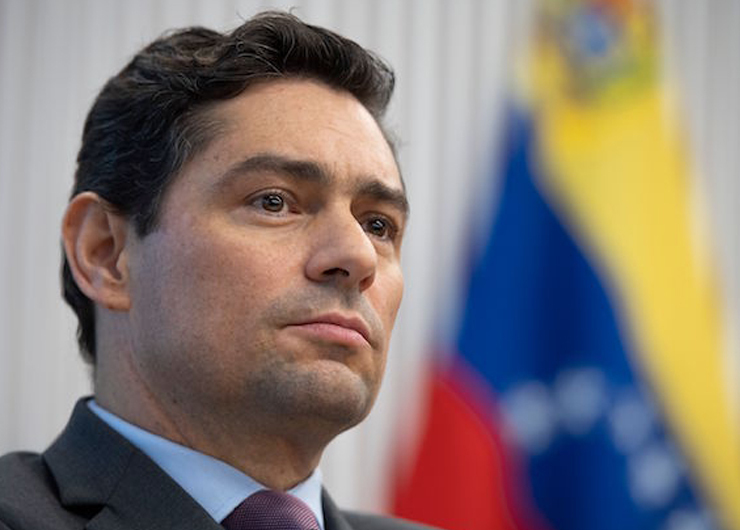 On February 27, 2014, during the demonstrations in Venezuela in 2014, Voluntad Popular confirmed that there was an arrest warrant, issued on February 17 by a Caracas court, for Carlos Vecchio. He was accused of arson, public incitement, damage to public and private property and association to commit a crime. Vecchio went into hiding, subsequently entering into exile in the United States. On February 10, 2015, in an interview with journalist Jorge Ramos Ávalos of Univisión, Vecchio explained that it was Leopoldo López, a Venezuelan politician under house arrest, who decided that Vecchio would have to withdraw into hiding in order to take charge of the party. Voluntad Popular also determined that Vecchio should leave Venezuela in order to denounce the situation transpiring in Venezuela. Vecchio was born in Caripe, Monagas State, Venezuela, on June 6, 1969.